Having pinched the idea from Snapchat, Instagram has been pushing its temporary Stories feature as a way of sharing parts of your day that aren't suitable for a fully filtered permanent post. Now it seems like Stories are going to get even more prominent. As spotted by The Verge, the app is now testing a fixed Stories pane at the top of the feed, which stays in place as you scroll. If your friends have posted something in the last 24 hours, then you're certainly going to know about it – tapping through to view the photos and videos is the only way to get relief. At the moment the Stories bubbles appear at the top of the feed and then between certain posts lower down as you scroll, if you don't watch them straight away. The change would make the feature a fixed part of the interface. The new permanent Stories bar certainly isn't available to everyone yet and may not ever roll out. 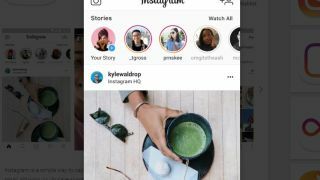 Instagram told The Verge that it tests tweaks to the app all the time, and these tests don't always make it out to all of Instagram's millions of users. Still, it's evidence of just how important the new Stories format has become in the world of social media sharing. Having first found success on Snapchat, it's since been adopted by Instagram and Facebook as a less pressured way of letting friends know what you're up to – a temporary option that doesn't need quite so much curation. No doubt something else will be along to replace the Stories format eventually, as surely as Facebook replaced MySpace. In the meantime, get ready to see more of the Stories posted by your friends and family, at least in Instagram.